The city of Portland appears poised to reach a settlement to clean up one of the most polluted segments of the Portland Harbor Superfund site. The vote is on the Portland City Council's Wednesday agenda and would commit $400,000 in city money to clean up toxic sediment in river mile 11 on the Willamette. 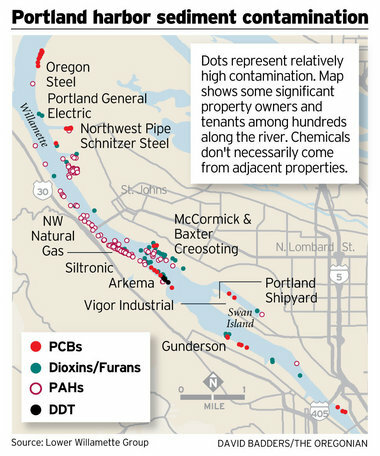 As WW reported in a cover story in March 2012, the city, the Port of Portland and businesses have been negotiating who is responsible to clean up the river, which was for decades polluted with toxic chemicals from riverside properties. "The City and several other potentially responsible parties have negotiated the terms of an Administrative Settlement Agreement and Order On Consent (AOC) with the U.S. Environmental Protection Agency to conduct additional actions at River Mile 11E in preparation for remediation of contaminated sediments after EPA issues a Record of Decision for the Portland Harbor Superfund Site," an April 4 memo from the Bureau of Environmental Services reads. The segment of the river is one of the dirtiest in the 11-mile Superfund site, which stretches north from the Fremont Bridge almost to where the Willamette flows into the Columbia River. "This represents a step forward for a cleaner Willamette," says Travis Williams of Willamette Riverkeeper. "The EPA deserves a good amount of credit for continuing to try to move this cleanup site forward over the past 18 months. It is good that those who signed this agreement recognize the value of moving forward together."